VALLEY, Neb. 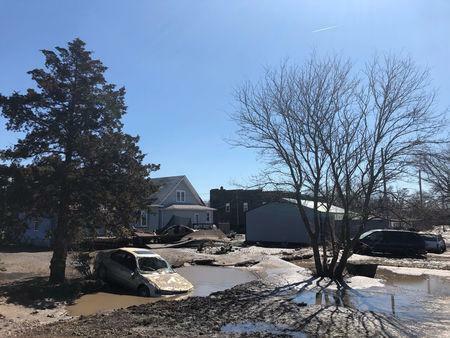 (Reuters) - A string of small Missouri towns on Wednesday prepared for the next deluge along the snow-melt-swollen Missouri River after flooding wreaked nearly $1.5 billion in damage in Nebraska, killing at least four people and leaving another man missing. High water unleashed by last week's late-winter storm and swiftly melting snow this week has already inundated a large swath of Missouri, Nebraska and Iowa along the Missouri River, North America's longest river. States of emergency have been declared in all or parts of the three Midwestern farm states. The Missouri River's next big flood crest was due to hit St. Joseph, Missouri, about 55 miles (89 km) north of Kansas City, Missouri, and Atchison, Kansas, a short distance downstream, U.S. Army Corps of Engineers spokesman James Lowe said on a briefing call.